Rittenhouse Archives and www.scifihobby.com are pleased to announce the signing of trading card licenses for two fantastic sci-fi properties: The Dead Zone and Stargate Atlantis. 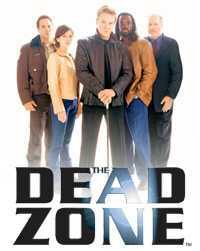 The Dead Zone is based on the characters and story from the best-selling novel by Stephen King. The Dead Zone is a psychological thriller that combines a rich mix of action, romance, and the paranormal with a continuing quest for justice. The show revolves around Johnny Smith (played by Anthony Michael Hall) a former high school science teacher who is left in a deep coma after a near-fatal car crash. Now, more than six years later, Johnny has awakened to a world in which he has lost everything that mattered to him most. His mother has passed away, his teaching position at the high school has long ago been filled, and his fianc�e Sarah (Nicole deBoer) has moved on and married County Sheriff Walt Bannerman (Chris Bruno). Sarah also now has a son named Johnny (Spencer Achtymichuk) - a son who was actually conceived with Johnny on the eve of his accident. But Johnny himself is also not the same person he once was: he is now in possession of amazing extrasensory powers, powers which allow him to see into both the past and the future through startlingly vivid visions triggered by a simple touch. His new abilities stem from a part of his brain known as "the dead zone," a normally dormant area of the human brain that has now become active in Johnny's head as a result of his trauma. Johnny finds himself trying to come to terms with his unique gift. Unable to ignore his frequent visions of others at risk, he has already found that his new talent comes with enormous responsibilities - and enormous public attention. Hidden deep in the Antarctic, the Stargate SG-1 team has discovered a long forgotten outpost base of the Ancients, the creators of the Stargates. There they discovered a new Stargate that connects to an entirely new network of gates that extends out of our known galaxy and into the Pegasus Galaxy. Dr. Elizabeth Weir, hand picked by the President of the United States, has assembled an elite team to explore  for the first time  this new galaxy. This is the foundation for the Stargate SG-1 spin-off show Stargate Atlantis which will debute this July on the SciFi Channel. With Stargate SG-1 preparing to start its eight season and its continual rise in both viewership and fan base, the spin-off series is sure to be a hit with both new and old fans alike. Rittenhouse Archives plans to release the first set of The Dead Zone trading cards in the September of 2003, which will cover the first two seasons of the show while the first series of trading cards for Stargate Atlantis is expected to be available in later half of 2005. More information about Rittenhouse's new series of cards based on these shows will be made available in the months ahead.